Paul Trevor came to Liverpool in 1975 as part of the ‘Survival Programmes’ project, which looked at inner city deprivation. 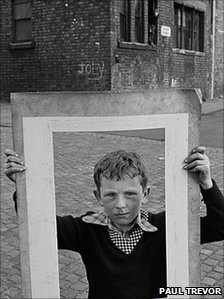 The young snapper spent several months recording family life on the fringes of the city centre, concentrating in Granby and Everton. Among the terraced streets and high rise flats, Paul captured images of a community defiant and proud despite a backdrop of mass unemployment and poverty. Photographers across Merseyside are being urged to “capture Liverpool” and take part in the city’s first international photography festival. Look11 will feature exhibitions of work from around the world as well as talks, seminars and community workshops. But organisers of the event are also running a competition, open to anyone interested in photography, that takes the city itself as the theme. Hundreds of entries are expected and ten £500 prizes are on offer. Visit the Look11 website here. It looks really exciting. It’s remarkable to think some of us in the group were kids and teenagers when this wonderful documentary was made. Made for the BBC in 1958 and transmitted in early 1959, it depicts working-class life in the back-to-backs of an unnamed northern city. Much of the shooting took place in Liverpool, but areas of Manchester, Salford and Stockport also make an appearance. As said in previous posts, as well as the subject matter’s being fascinating, the history of documentary is important too. Here is an example which was very unusual for its time with no ‘voice over’ and the use of music and people’s own voices. We tend to forget how close we are to the ‘olden days’. For some of us our parents or grandparents were around when the workhouses were still operating. One of the group members is working on a project looking at Walton Workhouse where his grandfather worked. Here’s an extract from a great documentary made by the then young film maker, Nick Broomfield. It features residents of Kirkby talking about the awful conditions of their housing. We looked at it as part of a wider look at poverty, housing and health in Liverpool and the area. Going back to old documents about life in the workhouse, we went on to examine printed materials, look at old pictures, watch films, read books and listen to archived radio interviews. Importantly, we looked not only at documentary stuff but also dramas dealing with working class life. We have an ongoing interest in the subjects raised by these issues, but we’re also looking at the changing history of the media themselves. How ‘ordinary’ people’s voices, lives and concerns are represented; who makes the representations; how they’re distributed. Over the coming posts we’ll publish, among other things, more links like this one from our youtube collection.